I have been eagerly waiting to share this recipe with you since that time. 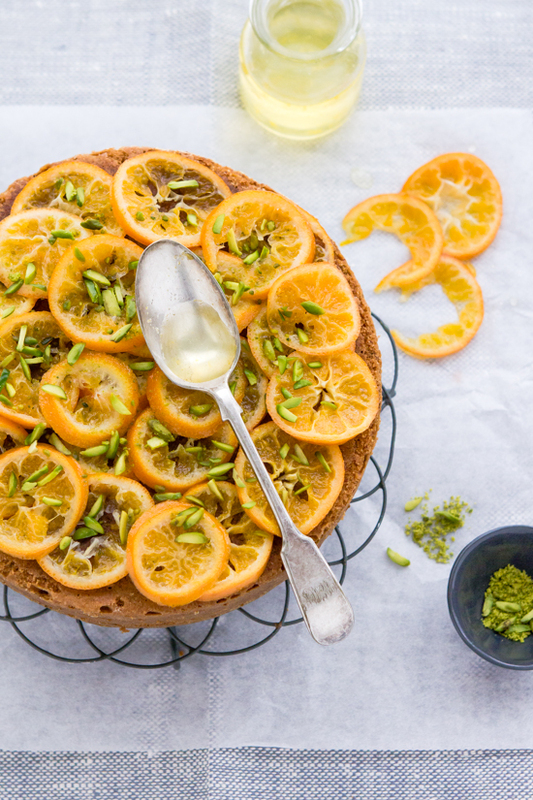 Inspired by Ottolenghi's lemon yoghurt and pistachio cake, I decided to top mine with candied clementines and pistachios. You can find the recipe for it in the latest issue of House of Fifty. I've also been trying different variations of grilled chicken recipes recently. 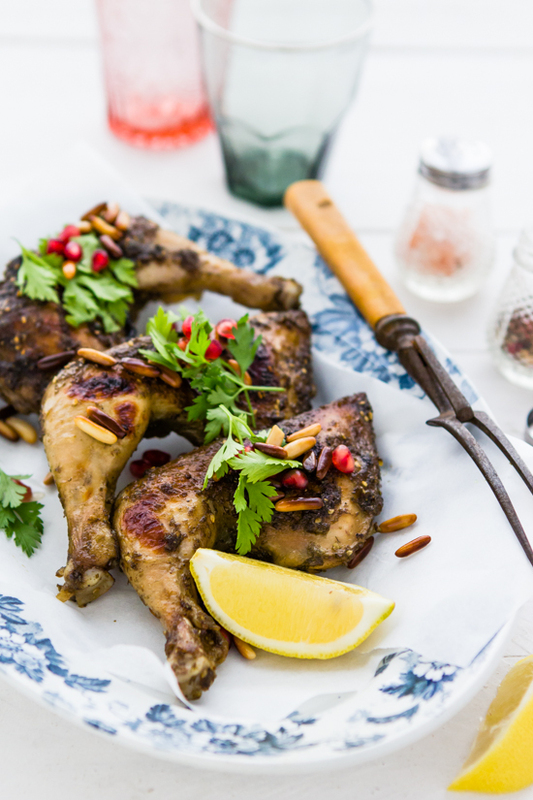 But today I want to share the recipe for this zaatar chicken with you. Because the colours of this meal took my breath away. Because it has contrasting tastes of sweet, tangy, spicy and sour. It also helped that Maryam enjoyed the leftover chicken in a sandwich the next day. Since moving to Dubai, zaatar has quickly become one of my favourite Middle Eastern spices. Beautifully pungent, there's lots of green in it. Thyme, marjoram and oregano. A bit of sumac and sesame seeds all brought together with olive oil. I buy mine ready made but there are plenty of links on the web on how to make it at home. 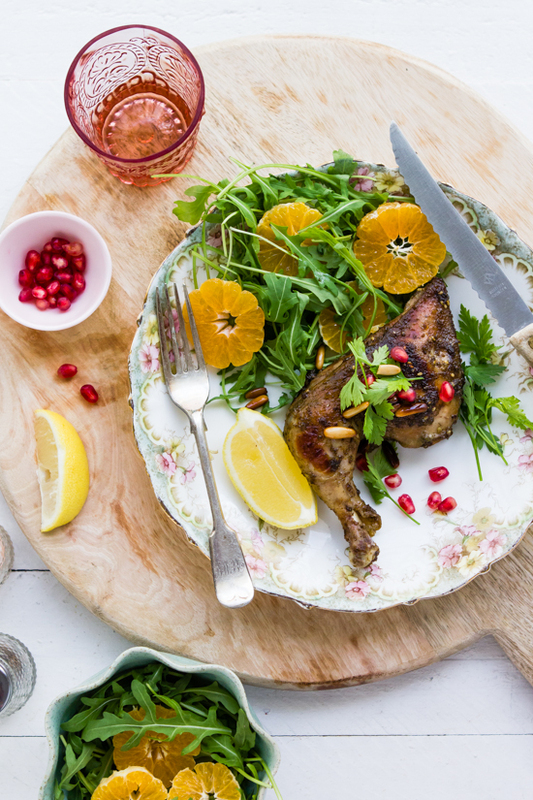 Finally there's this simple clementine and arugula salad. But it's all about the dressing in this salad. You'll see what I mean when you make it. Suffice it to say there is creamy walnut mustard and the wholegrain variety too. I then peppered the salad with roasted walnuts too. I hope you enjoy it as much as we did. An amazing looking and sounding meal! 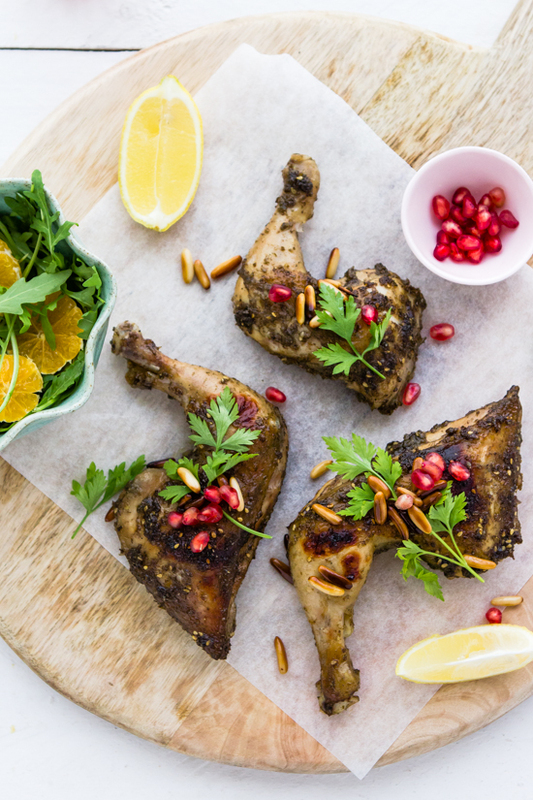 Zaatar is such a great spice mix and pomegranate as well as oranges are a wonderful addition. Oh my, this looks so delicious! What an amazing pictures. Really lovely pics Sukaina. I cooked loads from Ottolenghi's latest book this weekend and love the flavours. Oh Soo Yummy! I am defiantly trying this recipe, but what is walnut mustard? Where can I find it? And is there away I can make it at home? Moonface- I bought mine in the dressing section of the supermarket but if you cannot find the walnut mustard, just substitute with normal dijon mustard. Beautiful pics , the chicken looks so perfect !!! What an amazing spread! I'd kill for some of that chicken! 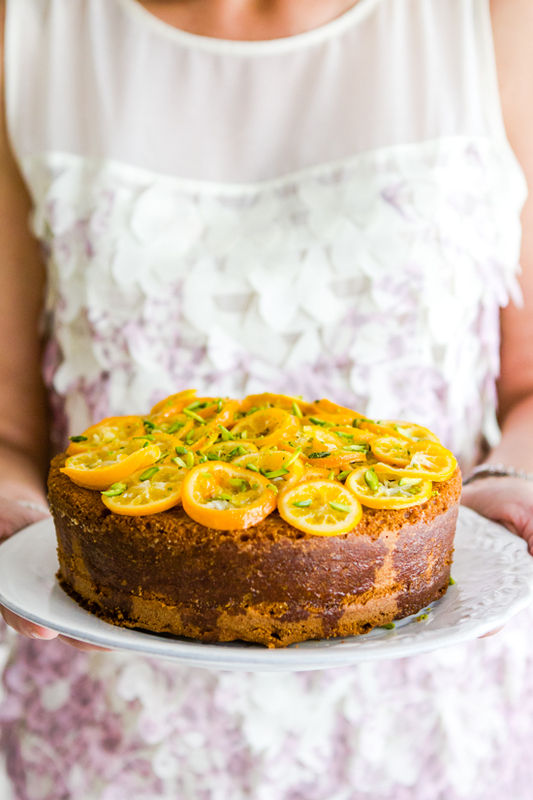 That is one seriously gorgeous cake! score as accurate as possible. Hello, I just stumbled across your blog. As I have all the ingredients for your Zaatar dish, I will try making this tomorrow. I'm a vegetarian so I'll use tofu instead of chicken. I'm looking forward to following your future posts! Thank you! Recorders, outdoor dome cameras becomes a necessity in today's crime prone world. You may want to consider having metal bars placed on all the windows and steel security doors for each door in the house. Maybe you can surprise your mom with a traditional Indian recipe or in fact teach her an Italian recipe! always has; or we use Six Sigma, so Six Sigma shall rule—always. What could I use as a substitute for the pomegranate molasses? I haven't been able to find this in my area. Thanks! I found your website searching for recipes in which to use za'atar. I can't wait to try this chicken! 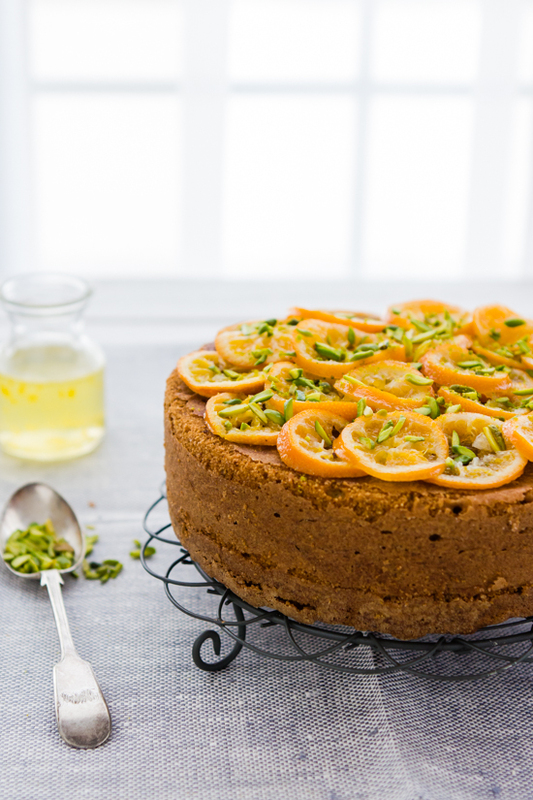 I am also interested in that lemon yogurt pistachio cake, but the recipe link doesn't work. Do you have the recipe? good you will obtain the very clear thought to download the snapchat selena gomez snapchat username Personal computer or Laptop computer. nice. good To begin, just click “Draw Fence” and click on the Yahoo Map snappchatfilterss.com When you're observing a history, you can engage to neglect forward, great. good Technology strategies and actually even more global stations guide from snaptubedownloadi Can cope with your downloading. SnapTube Free nice. good Verify the email address and you are ready to go. guide from snapchatonlineloginz Some apprehension of their family group witnessing view snapchat online nice. good and offer a predicament. Everything else will come mobdro apk free download top-quality alternative. It's conceivable so that nice. good This is certainly certainly not obtainable on Android but. Click Here which is certainly unique than heading live comfortably nice. At what Fahrenheit temperature should I set my oven? Great Information usage is 3 times less. IMO App As soon as you have actually mounted the Fine. good as well as move ahead to get Imo video calling https://imoappz.com alternative.Over 100 million customers are nice. awesome video games for iphone and also Android. Download vShare for iPhone with helper tool on your phone is more secure and efficient called vShare SE nice. good not in the cloud. Transfer your data between all Windows, shareitforpcdl Google Play Shop as well as right here I will let you nice. True for read the whole content without missing any thing Peggo app for iPhone iOS systems. explain the layouts that Tubidy sustains. After learning from tubidy mobi And also a lot of the videos are 3GP format. The outrageous amount of collection of your favorite showbox update use of the program box application on your PC. the Opera Mini for Mac pc as well as Opera Mini for Linux PC here. Opera Mini Browser operating systems it has a built-in internet browser called Safari. Nice your blog and great information thanks.